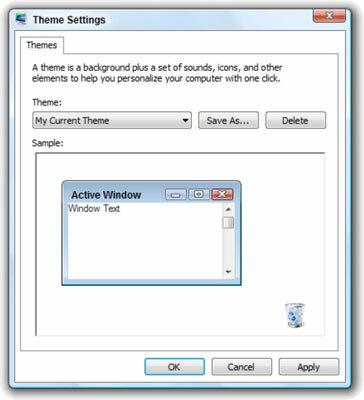 It’s easy to create a theme in Windows Vista — wallpaper (desktop background), colors, icons, screen saver, mouse pointers, even your own custom sounds. That’s pretty cool, especially if you have a good reason to create a theme — like, oh, a new addition to the family. Microsoft created the concept of a Windows desktop “theme” so it could make more money. That probably doesn’t surprise you. Starting in the times of Windows 98, Windows Plus! Packs (you may recognize them from the Da Vinci, Nature, or Space themes) made a few coppers for the coffers. Fortunately, you can subvert Microsoft’s method for your own purposes. 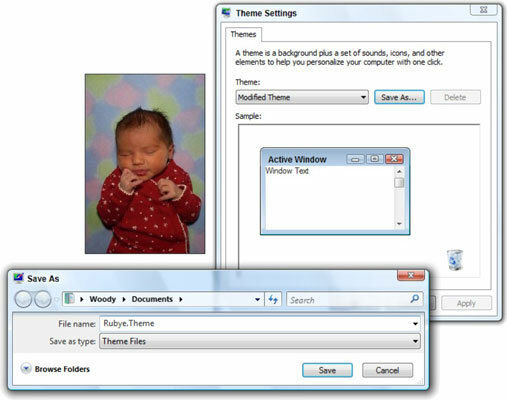 Vista stores theme settings in files with the extension .theme. 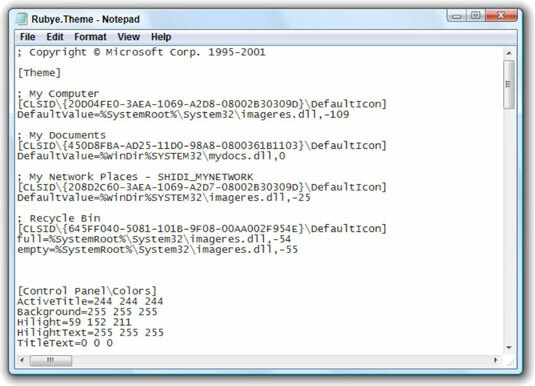 Microsoft doesn’t talk about it much, but a theme file contains Registry entries. Fortunately, you don’t need to change the Registry entries directly. For safety’s sake, save your current theme settings, in case you ever want to use them again. 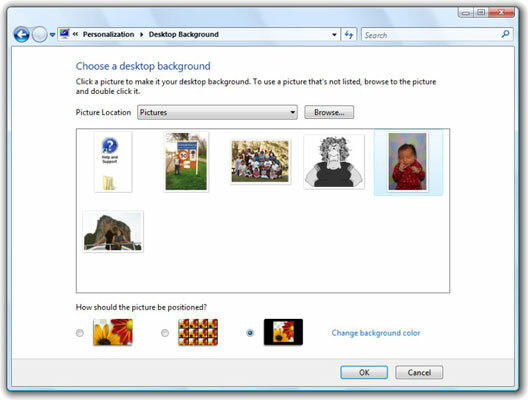 Right-click any empty part of the desktop and choose Personalize. You see the Personalization dialog box. In the Personalization dialog box, click the Theme icon. You see the Theme Settings dialog box. 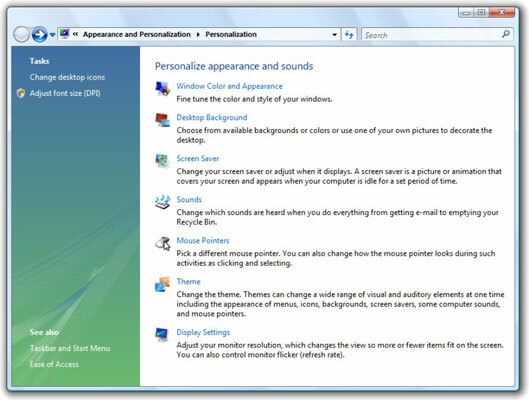 If you haven’t made any changes at all to your desktop, the Theme drop-down box may say Windows Vista or Satisfied OEM Customer, or it may have some other setting that your computer manufacturer established. You see a garden-variety Vista Save As dialog box. Type a name for your current theme and click Save. Consider giving it a name with the current date, or something else that’s distinctive, in case you completely mess up your new theme and want to go back. Click OK to get out of the Theme Settings dialog box. If you want to use your own picture for the theme’s wallpaper (er, desktop background), take a moment and make sure that the picture is in your Pictures folder. Although Step 6 isn’t absolutely necessary, it will save you a bunch of time if you ever want to move your theme to a different computer. Back in the Personalization dialog box (see Step 1), click the Desktop Background link. You see the Choose a Desktop Background dialog box. Pick the wallpaper that you want to use for your theme, choose how you want it positioned, and change the background color by clicking the link, if you like. When you’re done, click OK.
You can choose any of the standard Vista-supplied pictures, but (as noted in Step 6) if you pick your own picture, make sure it’s in your Pictures folder before you choose it. Back in the Personalization dialog box, click the links to change your Screen Saver, Sounds, or Mouse Pointers. You can also click the tasks on the left to Change Desktop Icons (which is to say, the appearance of standard desktop icons like the Recycle Bin) or Adjust Font Size. Although you can click the links to change the Window Color and Appearance or the Display Settings, most of the changes you make in those categories aren’t reflected in the theme. When you’re happy with all the changes you’ve made go back to the Personalization dialog box. You see the Theme Settings box, and the Theme drop-down list says Modified Theme. Vista shows you the Save As dialog box. In this case, it was Rubye.Theme. Click OK to get out of the Theme Settings dialog box, and then “X” out of the Personalization dialog box. Anytime you want to bring back this theme, just go the Personalization dialog box, click the Theme icon, and choose Rubye in the Theme drop-down list. You have now created a theme to use on your computer or even to distribute to your friends and family.